There are two ways to read this poll. 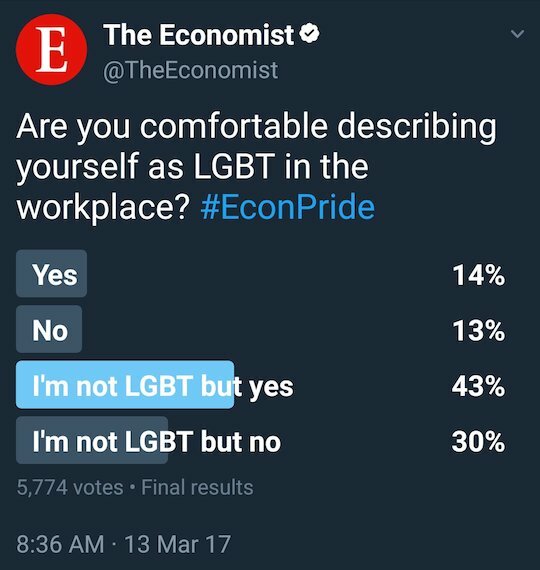 One is that a little less than half of straight people feel comfortable describing themselves as LGBT in the workplace, i.e. gay voice. Let’s hope that’s not how they understood the question. The other interpretation is that straight people have an idea of how safe it is to come out in their own workplaces, and it’s a lot sunnier than how their actually LGBT coworkers see it. Now is a good time to remember that online polls do not reflect broader trends. A full 27% of the respondents to this one identify as LGBT, which is about seven times the national average in the United States. That’s what you would expect from a poll about how you feel about describing yourself as gay. Gay people are more likely to click on that. Yet a substantial number of straight people clicked on it, too—about three times as many as the LGBT respondents. Already, we see that we are sampling the opinions of a certain kind of straight person. They are not LGBT in their workplaces, but they feel like they know how it would go. Again, I guess it’s possible they didn’t read the question as a hypothetical and mean that they comfortably fake being gay at work, but one hopes a plurality of respondents aren’t doing that. It’s likely respondents to this poll are imagining the experiences of their LGBT coworkers. More of them imagine that experience to be comfortable than report it as so. This result is similar to the result of this survey on blacks’ and whites’ views of racial discrimination. More white people say police are fair to black people. Fewer believe in blacks experience discrimination in stores and restaurants, or in that socioeconomic crucible we all know and love, the workplace. Black people and white people consistently disagree about the experience of black people by large margins. When you put it that way, it seems obvious whom to believe. Maybe neither side is right. It’s probable that black respondents’ perception of discrimination against themselves is influenced by self-pity. That’s definitely been going on with white people. But at the risk of treating a premise like a conclusion: People who aren’t members of a particular group underestimate how much discrimination that group faces. Either that or black and LGBT people are just being babies. Somehow, that does not strike me as the likely explanation. What’s between cultural appropriation and cultural segregation? Writer and ethicist Kenan Malik has written an editorial for the Times titled In Defense of Cultural Appropriation, but he spends less time defending appropriation than critiquing how we address it. He opens by discussing Hal Niedzviecki, who resigned from the Canadian Writers’ Union magazine Write after publishing a column “defending the right of white authors to create characters from minority or indigenous backgrounds.” The outcry, particularly on social media, was intense. Malik mentions another editor, Jonathan Kay of The Walrus, who was “compelled” to resign after merely tweeting in support of Niedzviecki. These examples imply that we are way too worked up about cultural appropriation, partly because we cannot agree what it is. Malik’s example of an editor who was pilloried for suggesting that authors should write about people from other ethnic and cultural backgrounds certainly looks like moralism run amok. But he leaves out some important details, including that Niedzviecki wrote his editorial for an issue of Write devoted to indigenous authors. In this context, his call for writers to “relentlessly explore the lives of people who aren’t like you [and] win the Appropriation Prize” reads like a defense of white authorship. 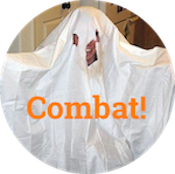 It constitutes fair warning to anyone who would interrogate the idea of cultural appropriation: be careful not to argue for privilege in disguise. Still, I think most people would agree that white authors should write nonwhite characters. It would be racist if they didn’t. But anyone who has read a book before knows authors routinely screw up when they try to write other races, often in ways that reinforce prejudice. We don’t want to say white writers should only write about white people, but we also don’t want to say that every white depiction of nonwhite cultures is just fine. 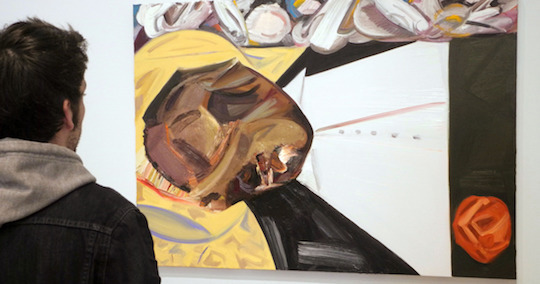 When does art that reflects modern cultural pluralism become cultural appropriation? What we need here is a definition. Malik cites Susan Scafidi’s claim that cultural appropriation means “taking intellectual property, traditional knowledge, cultural expressions, or artifacts from someone else’s culture without permission.” This definition introduces the fairly obvious question of who could give such permission. If I wrote a letter to Al Sharpton asking permission to write about a black man, A) that would be racist and B) his permission would not be meaningful. No individual can license a culture. Scafidi’s definition of appropriation seems more useful as a negative: Although no one can give permission to use a culture, pretty much anyone can deny permission to use a culture. Cultural appropriation happens when an artist evokes culture in a way that pisses someone off. That actually seems like a pretty good rule of thumb. If your depiction of another culture has angered someone who identifies with that culture, you probably screwed up. Still, we can’t adopt the idea that cultural appropriation is whatever anyone says it is. We want to be able distinguish between obvious instances of appropriation, like Katy Perry in a geisha costume, and claims of appropriation that might not be made in good faith, such as the Oberlin students who called appropriation on a bad banh mi in their cafeteria. Bad pan-Asian cuisine my be a crime against gastronomy, but I wouldn’t call it unethical. Putting zucchini in a stir fry is not wrong in the same way as dressing up as an Indian for Halloween. Implicit in our idea of cultural appropriation is that it’s bad because it hurts people. Few would argue that it’s bad because white and nonwhite cultures should stay separate. It might be appropriation when Macklemore makes terrible hip hop, but it’s not appropriation for white kids to listen to Ice Cube. Whatever value we’re trying to protect when we criticize cultural appropriation, it’s not the segregation of cultural products by race. So what is it? Malik skirts this question and instead argues that trying to stop cultural appropriation will not meaningfully impact systemic racism. That might be true. Stopping your uncle from saying the n-word at Christmas won’t meaningfully impact systemic racism, either, but it’s nice. Malik cites the example of Elvis Presley, who became famous playing the same “race music” radio stations refused to air when Chuck Berry played it. That was surely an injustice, but stopping it wouldn’t have changed Jim Crow, Malik argues. He’s not wrong. But it does seem wrong that a white man could make a fortune playing black music when a black man could not. We need to put our finger on what’s wrong with that, if our discussions of cultural appropriation are to have any meaning. It can’t just be that white people aren’t allowed to do black stuff. That too closely resembles the old system. Neither can we conclude that white people are allowed to do whatever, for the same reason. I find the topic of cultural appropriation endlessly interesting, because it keeps pitting contemporary values against each other. We want to live in a plural society, where traditions from different cultures come together to create an American culture that we all own together. But we also want members of nonwhite groups to retain ownership of their own cultures, if for no other reason than that so much has been taken from them already. I don’t know how to reconcile these competing values. I suspect we will keep arguing about it. How fake is Alex Jones? Hold the phone—is Alex Jones breaking kayfabe? Never break kayfabe. The only time it’s okay is when your kids are on the line, as in the 1980s WWF storyline where Macho Man Randy Savage pretended to break kayfabe by wearing a suit and appearing in family court as Randall Saváge, but then his essentially macho nature broke through and he hit his kids with a chair. 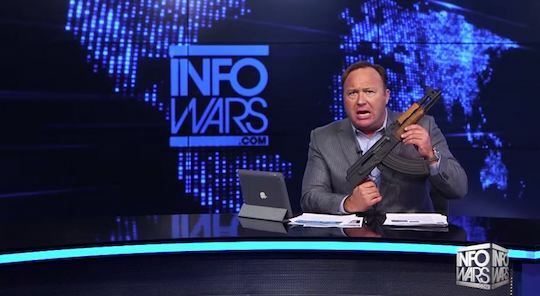 Anyway, if you ever wanted to pin down Alex Jones and ask him whether he believes all the conspiracies his show presents as news, now is the time in Travis County. “Each” is singular, you guys. The question in the poll whose results are pictured above should be “How credible is each of the following?” Informal polling finds me unpopular, still. But this formal poll from the Morning Consult brand-tracking company finds that, despite widespread abuse of the phrase “fake news,” most people still think mainstream news outlets are believable. Sixty-three percent of those polled, for example, rated The New York Times as “credible” or “very credible.” It’s kind of terrifying that a third of respondents don’t trust the longest-established journalistic institution in the United States, and the write-up suggests that this portion is larger than it has been historically. But the overall lesson to be taken from these admittedly months-old numbers is that President Trump’s gaslighting re: news has not succeeded in turning Americans against the media. You may have noticed a more interesting nugget at the bottom of the chart, though. A combined 19 percent of poll respondents said Breitbart was a credible source for news. That’s only one point higher than the percentage of respondents who said the same thing about The Onion, an explicitly satirical venture trafficking in obviously made-up stories. The Onion beats InfoWars, which I thought was implicitly satirical until about 18 months ago. But Breitbart is a horse of a different color. It puts “news” right in its name, and its former executive chair is now the White House chief strategist. That this nominal news organization would enjoy the same credibility as The Onion is astounding, given its influence. But here we encounter the misleading elements of polls, which are—dare I say it?—kind of fake news. You will notice that the “credible” and “not credible” numbers for these outlets don’t add up to 100 percent. The missing portion comprises people who have never heard of the outlet in question. For instance, 42% of respondents said they had never heard of Breitbart, which is heartening. 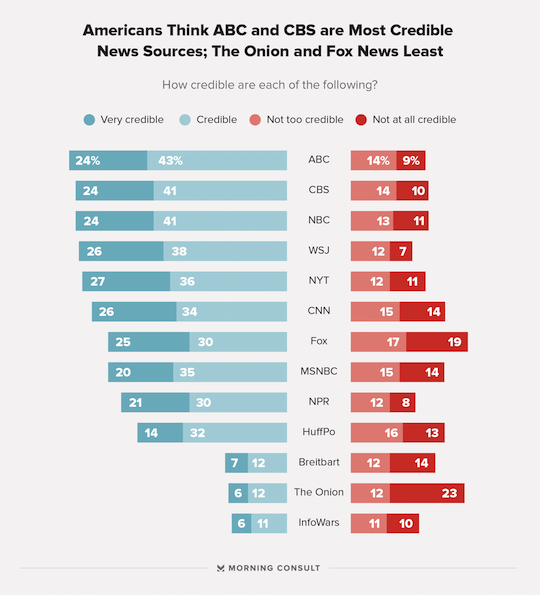 According to the crosstabs, 32% have never heard of The Onion, and another 15% said they had heard of it but had no opinion of its credibility. One presumes that a significant number of these respondents knew it it was satirical and therefore found the question of its credibility irrelevant. While we’re presuming stuff, the spike in The Onion’s credibility among 30- to 44-year-olds might be attributable to smartassery. Anyway, The Onion and Breitbart may not be comparably trusted so much as comparably unknown. That, too, is terrifying, given the enormous popularity of one and the enormous shittiness of the other. But the larger epistemological point—that we should not take this poll to mean that people trust Breitbart about as much as they trust The Onion—holds up. Polls mislead. Also, 17% of the country has never heard of the Wall Street Journal. What a time to be alive. Kellyanne Conway sits weird: racist? Kellyanne Conway sits on an Oval Office sofa in this photo by Brendan Smialowski. As of this writing, the internet is aflame over the above photograph of Kellyanne Conway during a meeting between President Trump and the leaders of historically black colleges and universities. You should know that this photo was taken shortly after Conway took a picture with her phone, so she’s seeing how that picture came out rather than just ignoring black education to check Twitter. Still, her posture is weird. Are we to believe that she is shoeless? Or has she crammed her shoes between the cushion and the back of this Oval Office couch? There is something adolescent about her pose, or maybe…coquettish? It’s peculiar, is what it is, and this photo has become a lightning rod for interpretation.